House vs. flat-which is best for investment? When a property investor is starting out, one of the first things they will probably consider is whether to buy a house or a flat/apartment. This seems a logical place to start, but, in reality, it would be prudent to ask a different question before deciding the type of property to invest in. That question is “Where is the tenant demand?”. The answer to that enquiry will determine the type of investment to purchase. After all, you want to know that there are plenty of tenants willing to rent in your property, otherwise you may struggle to make a success of your business. So high tenant demand should be the first thing to consider and look for. Additionally, you also need to understand the tenant demographic in the area. It could be predominantly young professionals (typically city centres), families (typically rent within good school catchment areas), or tenants in receipt of housing benefit/Universal Credit. Tenants in receipts of benefits are generally the province of more experienced “hands on” landlords, not to mention that, if using mortgage finance, many lenders will not lend on properties for renting to tenants of this demographic. Lenders obviously regard this type of tenant as higher risk. So how do you find out the demand for any type of tenant in any area? Well one simple way is to pick up the phone to your local Northwood office! Each office – and there are over 85 of them across the UK – will know the tenant demand in their area and be able to advise and guide you towards a sound investment. They will know if there is an over-saturation of flats (often the case in city centres) or if there are too many houses for rent in the area and not enough family tenants. Your local Northwood office will not only be able to tell you where the tenant demand is, but if its flats, they will be able to advise whether one or two bed flats are most popular. If it is houses, they will know whether 2, 3, or 4 bed houses have the highest demand. But local knowledge goes down to an even deeper granular level. There will be certain areas, even streets, of towns and cities that are more popular with tenants. This may be down to such issues as good transport links, amenities, school catchment area, low crime rate, and quality of the housing stock and neighbourhood. Nothing beats local knowledge when researching a viable property investment and your local Northwood agent is happy to advise. There are of course pros and cons of both flats and houses. The main thing to take into account is that flats are subject to service charges and ground rent and these can impact on your cash flow. They are also generally leasehold and it is important to understand that what you are getting when you purchase a leasehold property is a lease, which is a long-term rental contract that governs the relationship between the freeholder, the flat owner and the management company. Leasehold properties come with their own set of issues and, if using mortgage finance, most lenders will not lend on a property with a lease of less than 80 years. Many city centres in the U.K. can be subject to over-saturation of new build flats. These are often offered to investors “off plan”, meaning many of them are sold to people who will all be competing for tenants once the flats are completed. As a general rule, flats tend to attract tenants who are more transient, but are a popular choice for young professionals and sharers. Generally speaker, smaller flats – 1 beds – deliver the best yields. Houses tend to be be freehold, meaning there are no service charges or ground rents. There are also fewer of them being built. Families tend to want to put down roots, and once children are in the local school, the house will often be rented for the duration of the children’s education. This means less voids and tenant change-over, something that naturally appeals to landlords. New build properties, if in an area of high tenant demand, can be excellent for investment. Whether house or apartment, new builds typically come with a 10 year NHBC guarantee (or similar), a two year developer warranty, are all done to current building standards and regulations, and are in mint condition. appliances and ensuites to the master bedroom. It is vital to have new builds “snagged” to check for any defects. A professional company can undertake this for you and the developer will be obliged to correct any issues. These could range from poor decorating to appliances not plumbed in properly to bigger issues such as faulty electrics or windows not sealed properly. Once your new build has been snagged, then they a generally very low maintenance for the first few years. You won’t need to budget for a face-lift for around 7 to 10 years which means that cash flow in the early years is generally stronger than for a pre-owned property that may require up-dating, repairs, or more regular maintenance. Your budget will have some influence on whether you can purchase a flat or a house. Flats tend to be less expensive although it depends on the amenities offered by the development. Some apartment blocks come with extras like parking, concierge, gym etc. and these flats will command a premium price and a premium rent. Whether you buy a house or a flat, the main thing is to understand it from every angle and make sure that it is going to stack up as a profitable investment. 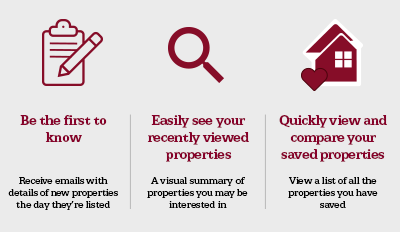 Your local Northwood office can advise and, if they have a sales division, they will be able to arrange viewings of properties on their books that are suited to investment. The more research you undertake, the more questions you ask, the more viewings you do, the better you will understand the area, get a feel for valuations, housing stock, and what stacks up. This will ultimately minimise your risk and ensure your investment is profitable and that you enjoy a happy landlord life!